The Melbourne tram decorated Karachi style for the Commonwealth Games will run free on the Melbourne City Circle tram route indefinetly. Vehicles of transport have long been celebrated in the Indus valley, adorned with elaborate decoration to keep good spirits with the journey. A fleet of particularly vibrant mini-buses ply the Karachi route called W-11, characterised by stainless-steel panels, brightly coloured plastic collages, flashing light patterns, music beats and exuberant conductors. Karachi had a horse-drawn tram system till the 1930s, then a petrol-fuelled system until the 1970s. Could there be a W-11 tram, a vehicle travelling from Karachi to Melbourne? 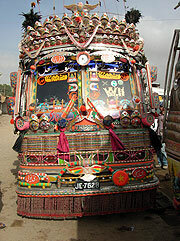 How would these Karachi vehicle decorators invoke the spirit of this transport? A team of W-11 vehicle decorators from Karachi will undertake a residency in Melbourne to transform a tram that will run a free service on the Melbourne City Circle tram route.